Internal Office Solutions' staff are certified professionals. Our high standards ensure our customers a level of competence, quality and service that is second to none. Like any structure, a network requires ongoing maintenance to consistently perform well. Support is not just a case of reviewing log files or checking the back up. It is also a matter of professional judgment and customer service. When you call for support, your call will be transferred to a certified professional that has had the appropriate vendor training to solve your problem. IOSi has Microsoft, Sun, HP, VMware, Platespin, and WatchGuard certified professionals ready to take your call. The idea of outsourcing your Information Technology operations may seem daunting at first, but the advantages available from an outsourcing partnership can far outweigh the costs -- assuming that you choose the right partner. 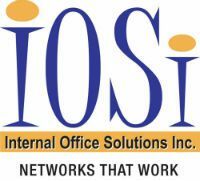 At IOSi, we have the experience, knowledge and dedication to handle all of your IT needs effectively, allowing you to focus on your core business and drive down your costs. From network design to equipment purchasing to network installation to telephony integration, we have the experience to build, manage, maintain and upgrade your network. We have core competencies in Windows, Unix, and Novell, and both Wide and Local Area Networks. We also have extensive experience with Internet security issues, and can help you manage your Internet connection to keep your data safe. On-Site Support : Our support personnel are dedicated to your office. We have a variety of coverage options available from support during normal business hours to support 24/7 with the flexibility to meet your needs. Remote Support / Administration: We use the latest technologies to support your system pro-actively, reducing your costs by using remote access software. For more information, please contact our sales team today.